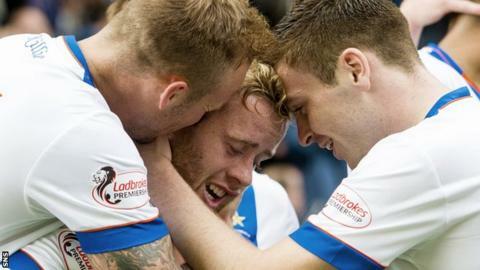 Kilmarnock match-winner Rory McKenzie believes back-to-back wins can be the catalyst for a top-six finish. McKenzie's second-half cross deflected off St Johnstone defender Brian Easton in what proved to be the difference between the sides at Rugby Park. Gary Locke's men capitalised on last weekend's win at Tannadice against Dundee United to beat St Johnstone 2-1. "It was massive," McKenzie told BBC Scotland weeks after they lost heavily at home to Dundee and Ross County. "We got off to a slow start today but last week certainly gave us the kick up the backside we needed and I felt we took last week into today. "In previous games we have conceded early and crumbled under the pressure but today I felt that even before the goal we were dominating play. "The top six has got to be the aim but the fact we are talking about winning more games is a positive because a few weeks ago we were down in the dumps and everyone was on our backs. "But we can't get ahead of ourselves." On the winner, which in some quarters was awarded as an Easton own goal, McKenzie was adamant it was his. "I'm taking it, [referee] Willie Collum put it down as my goal so it's my goal," he said. "You have to take everything you are given but I'm definitely claiming it. "It had been a while since we had won here in the league so the manager said we had to get the fans on board and I feel we've done that today." Locke himself insists he never doubted his players' character as he hailed his team's "best performance of the season". "I said it at the time, if you're not playing well and not getting results you deserve to get criticism," said the Kilmarnock manager. "I just hope now that the boys can get a bit of praise. I felt today that we played very, very well and thoroughly deserved the three points. "It's a great day for the boys and supporters, it's been a hard slog at times." The victory was tainted by an injury to goalkeeper Jamie MacDonald, who has been in superb form for the club and is now a doubt for Wednesday's Scottish League Cup tie against former club Hearts. "We'll give him 24 hours but it's a blow for us as he's been fantastic so hopefully it's not too serious," Locke added. "It leaves me with a bit of a headache for Wednesday now." St Johnstone manager Tommy Wright was left bemoaning his previously dependable rearguard as Saints failed to build on an impressive victory over Hamilton last weekend. "We started the game reasonably well, got a really good goal and looked the better side," he told BBC Scotland. "We don't defend a cross, one ball in the box and we don't stop it. "We had four or five chances to clear when they scored a freakish goal and we lose the game. "But that can happen and hopefully it doesn't happen too often. "We'll approach [Tuesday's League Cup tie at Rangers] in a positive manner. We'll go through things about how we'll set up at Ibrox. "But ultimately the players have to go out and not make mistakes and that's what happening at the minute."